I noticed that drones have become very popular for both business and personal use. When I say drones, I mean quadcopters. I admit, they’re pretty cool and fun to play with. They can take amazing videos and photos from high altitudes that would otherwise be difficult or costly. As cool as they are, the majority of the consumer market uses it for one purpose: a remote control camera. What a waste! These quadcopters are full of potential and all you can do with it is take high-tech selfies and spy on neighbors? Screw that. I’m going to get my hands on some drones and make them do more. I researched drones from different manufacturers and decided to get the one that is most hacker-friendly: The Parrot AR Drone. The Parrot AR Drone isn’t the most expensive or fancy, but it packs the most punch in terms of hackability. Unlike the radio frequency channel drones (which do allow you to fly at greater distances), the AR Drone is one of few that operate over wifi signals. Why do I prefer wifi? This means that the drone acts as a floating wireless access point and signals are transmitted using TCP or UDP protocols which can be replicated with your laptop or any device that is capable of connecting to a wifi access point. Among the available wifi drones, I chose the Parrot AR Drone because (as far as I know) it is the only drone with a documented API and open source SDK for you engineers that would like to do more than take aerial photos of your roof. A quick google search returned several AR Drone SDKs supporting a handful of different programming languages. Some are just wrappers around the official Parrot C SDK while others are a complete rewrite which directly calls the actual API (which is also well documented). This makes it much easier than I initially thought! 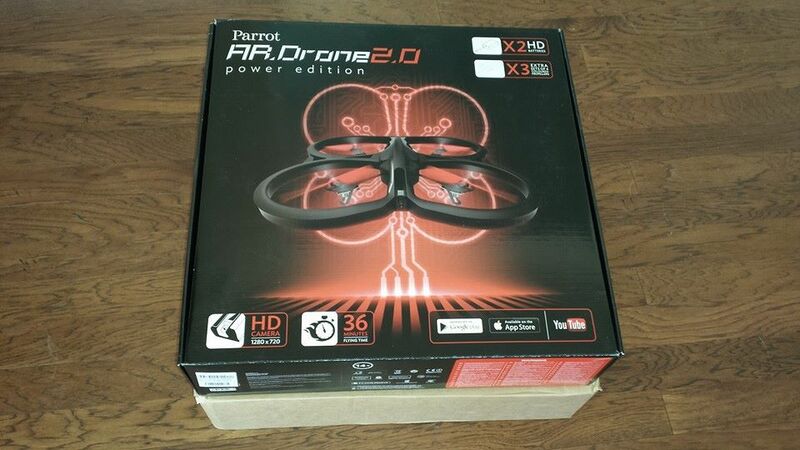 The first SDK I tried was python-ardrone which is written completely in Python. It’s actually very easy to use and even includes a demo script that allows you to manually control your drone with your computer keyboard. The only thing I disliked about it was its h264 video decoder. The included h264 video recorder pipes the h264 video stream to ffmpeg and waits for it to send raw frame data back. It takes that data and converts it into numPy arrays and then converts the numPy arrays into a PyGame surface. I had a hard time getting a video feed and when I got it, the feed was too slow to be of any use. I would love to play with it some more and figure out a fix for the video. Here is a video of me operating the drone using my laptop with the python-ardrone library. The next SDK I tried was the AR Drone Autopylot. The Autopylot library is written in C and requires the official Parrot SDK, but provides you with a way to implement your own add-ons in C, Python, or Matlab. It also allows you to manually control your drone with a PS3 or Logitech gamepad. I’m not sure how I feel about this as I wish it would include a way to navigate your drone with a keyboard. However, the h264 video decoder works really well, and that’s the most important requirement for this project. Since Autopylot gives me a working video feed, that’s what I decided to work with. As the first step to making an intelligent drone, I want to make my drone hover in the air and follow people. While this does not make my drone “intelligent”, the ability to apply computer vision algorithms plays a huge role in that. Thanks to friendly SDKs like Autopylot and python-ardrone, this is actually pretty simple. You may or may not have read my old blog post, My Face Tracking Robot, but in that post, I describe how I made my OpenCV library based face-tracking robot (or turret). All I have to do is apply the same haar cascade and CV logic to the Python drone SDK and I’m done! '''Accepts BGR image and optional object threshold between 0 and 255 (default = 100). # Routine called by C program. # Returns proportional distance to image center along specified dimension. Now autopylot_agent simply looks for a “track” method that returns the center coordinates of an object (in this case, a face) and navigates the drone to follow it. If you noticed, I’m using the frontal face haar cascade to detect the front of a human face. You can easily swap this out for a haar cascade to a profile face, upper body, eye, etc. You can even train it detect dogs or other animals or cars, etc. You get the idea. This works fine the way it is, however, I felt the need to improve upon the autopylot_agent module because I want the drone to rotate rather than strafe when following horizontal movement. By processing the “err_x” as a “yaw” rather than a “phi”, that can be fixed easily. Also, rather than just returning the centroid, I decided to modify it to return the height of the tracked object as well. This way, the drone can move closer to your face by using the “theta”. On my first test run with the “theta” feature, the drone found my face and flew right up to my throat and tried to choke me. I had to recalibrate it to chill out a bit. Remember… this is all autonomous movement. There are no humans controlling this thing! You may think it’s cute. Quite frankly, I think it’s a bit creepy. I’m already deathly afraid of clingy people and I just converted my drone into a stage 5 clinger. If you’re lonely and you want your drone to stalk you (if you’re into that sort of thing), you can download my the face tracking agent here… but be sure to download the ARDroneAutoPylot SDK here. A drone with the same purpose as this but a little more Indian-affordable model please! Hi SuryaTeja, I had no idea the AR Drone was so expensive in India. You certainly can use a DIY drone. I’ll try to get a prototype working so I can blog about it. In the meantime, you should try to play around and write with autonomous flight software for you DIY drone and show me! Dear Crankiln, I am a technology teacher and I am interested in buying a drone and program it with python. Then teach my students how to do it. I am not sure which drone will be better (in fact I have not idea whether or not any drone could be programmed with python). Could you please give me an advise about it. Hi. Currently, the only option for that is to use the AR Drone with the python SDK. I’m currently working on a wifi RX module that can replace existing RX modules found on other popular drone models that will be hacker friendly. Looking to make a similar one at my university! Hope I get some source code. But we are designing our own drone and program it. Please reply with some help! I have been studying AI for some time now and would like to do a project and using a drone seems like a good choice. My biggest question right now is choosing the drone that allows me to program in python and have telemetry in real time. The Ar.Drone 2.0 seems like a good choice but there is also the Bebop 2 that seems to have better features. As there is so much variadade of drone in the market and my budget is somewhat limited that I did not want to choose the wrong drone. In your opinion which is the most appropriate?